As a third party company, Sigma has made its mark within the photography industry. It has gained much recognition for the prime lenses that are commonly used. 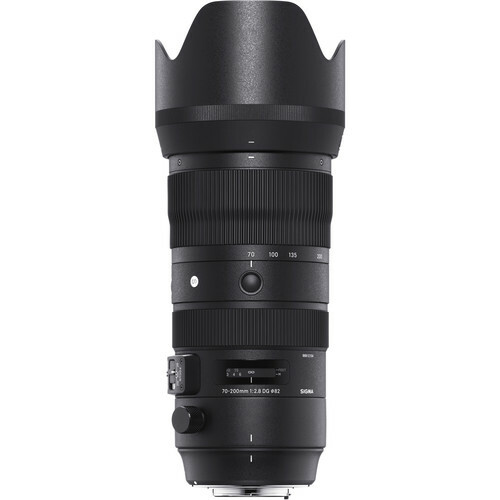 But Sigma is slowly stepping out of their comfort zone and starting to release a collection of zoom lenses as well. One of the first zoom lenses was the 24-70mm f/2.8 then the 70-200mm f/2.8 came around. Sigma has impressed many with these zoom lenses with never going below an aperture of f/2.8. The 70-200mm has become a lens where professionals from many different fields have been able to use it – from weddings to wildlife. The lens has the perfect focal range with a bright maximum aperture. Not only are its features incredible but the price point also calls for attention. In comparison to the majority of its competitors, it is way cheaper so those looking to save some of their coin, the Sigma 70-200mm is the go-to. As a 70mm-200mm lens, do not expect it to be small for obvious reasons. The lens itself is a magnesium alloy barrel which has a sturdy and hefty feel to it while its mount is made of brass. But with this hefty feel also comes weight and the Sigma lens is definitely heavier than its competition. The lens also has internal seals around vulnerable points which protect it from getting dust inside or any type of water splash. On the exterior, there is a rubber seal around the mount along with water and oil-resistant coating on the front and back. If you are familiar with the previous 70-200mm 1:2.8 EX DG OS HSM lens then handling this lens will be easy as the controls are in the same format. The zoom ring continues to be at the front of the barrel with its focusing ring right behind it. Along the side of the barrel, you will notice a line of switches that control the focusing mode, focus limit range, optical stabilization, and custom setting control. There is also a triplet of buttons that can be personally customized for different focusing controls. Depending on your camera’s autofocus system, the 70-200mm lens can really leave you impressed by its focusing range. The lens itself moves smoothly as it focuses on different points. You may get some noise if the lens is not focused on its subject but it is not much of a distraction regardless. The lens also has an Intelligent OS system that has four stops of correction that allows you to shoot at around 1/13 seconds at 200mm. When shooting at 1/10 seconds, images still came out sharp even though it was not consistent with every photo. Even at 1/8 seconds and 1/5 seconds, the image quality is surprisingly the same. If you are bothered by vignetting, take note that this lens vignettes at both ends of the focal range. Majority of the vignetting will be gone when you shoot at f/5 but this will only visibly work if you are shooting a uniform subject. While shooting at the telephoto end, the vignetting is moderate and improves at f/3.2. Once it is past f/4, it’s not much of an issue. Sharpness is one of the strongest qualities this lens has. Across all of its focal ranges at f/2.8, you can expect superb details in the majority of the images you capture – especially if there is consistency across the frame. As you close down on the aperture, the image details get sharper. But even at mid-range apertures like f/5.6, details are precise and if you are shooting in Raw, you won’t need much post-production in regards to sharpening. The Sigma 70-200mm lens is amazing for many reasons. It gives what professionals want – whether it is the sharp details at wide apertures, incredible control over chromatic aberrations, fast autofocus, and useful image stabilization. The build is also great as it has a sturdy feel along with weather sealing. One of the best aspects of the lens, however, is the price point. Although it’s not incredibly cheap, in comparison to its competitors – you can’t go wrong. Of course, there are some faults to this lens, like the weight and its vignetting but its pros definitely outshine the cons.